John L Sullivan is a born fighter. The Hollywood Strong Boy has already won the heavyweight box office belt as the director of such lightweight comedies as “Ants in Your Plants of 1939” and “Hey, Hey in The Hayloft” and now he's battling risk-averse studio honchos for his dream project. “O Brother Where Art Thou” will be a serious picture with symbolism and real-world meaning, the kind of movie Depression-era audiences really want. A (mostly) friendly executive suggests “Ants In Your Plants of 1941” instead, but John L. Sullivan has picked his fight and intends to go the distance. Sullivan is portrayed by the steady, inherently likeable Joel McCrea as an idealistic but naïve dreamer (both a “bonehead” and a “genius” according to his peers) who is stubborn and vain but is at least willing to accept a little constructive criticism. Reminded that his privileged life has left him short of the “real-world” knowledge he would need for his magnum opus, he plans to acquire said knowledge by posing as a drifter and hitting the road with just ten cents in his pocket. That's about a penny for each of the members of his entourage who trail him and help to provide one of the many parachutes he can deploy whenever the going gets rough. 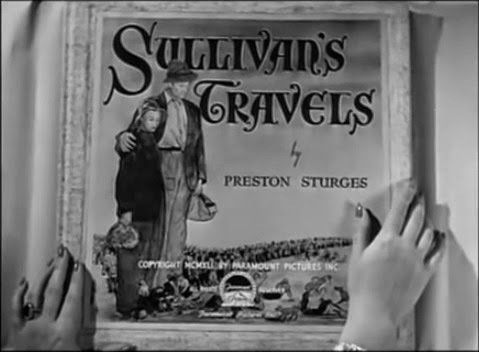 “Sullivan's Travels” (1941) was writer-director Preston Sturges's most autobiographical feature. Raised in privilege circumstances himself, Sturges was eager to promote himself as more of an everyday Joe though his easy command of sophisticated dialogue and his familiarity with the upper-crust always made that a bit of a tough sell. Sullivan isn't precisely a stand-in for Sturges, but he's not far removed from the real deal. If Sullivan's sporadic explorations teach him anything about poverty, it's that it is very cold. Fortunately he can always press the rich man's panic button and get warmed up whenever needed so any learning will be limited. If the narrative has something else to teach Sullivan, it's that the impoverished souls crowding America's trains and revival halls want and need nothing more than a good laugh. No “deep-dish” movies for an audience that hasn't even had lunch. A responsible “artiste” will work to fill that need instead of selfishly following his own ambitions. If that was the entire premise of the film, it would be pretty galling, populism at its most condescending outside of a politician's campaign speech. It would also seem to be an entirely inessential argument. Has there ever been a time when Hollywood studios needed a slap on the hand to keep them from being so ambitious and artsy and refusing to peddle formulaic escapist fare? But Sturges has a lot more on his mind and certainly doesn't intend to suggest that the director become a quiescent hack. “Sullivan's Travels” is indeed plenty artsy in its own right and so serious at times it becomes downright grim. The film shifts from screwball caper to a more serious register when Sullivan hops his first train; the scene takes on an almost documentary-like quality as the famous director playing at being a bum muscles his way through a crowd, make that a huddled mass, of itinerants gearing up for a desperate rush for a berth aboard a moving train. The worn faces, the tattered clothes, the frantic surge all speak to a deprivation so vast the silver screen can only catch an oblique glimpse of it. 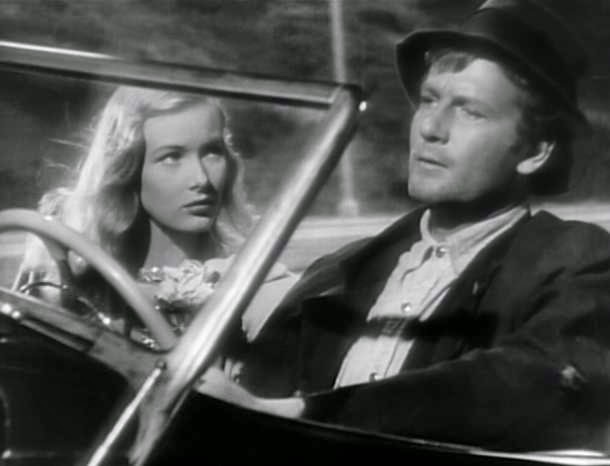 Accompanying Sullivan on this train ride is a young woman dressed as a boy, but since the young woman is played by Veronica Lake she isn't fooling anybody (although Sturges and company fooled viewers by strategically hiding Lake's advancing pregnancy). The unnamed girl showed Sullivan a little kindness when he was hard up for a meal, the first of several times he encounters spontaneous acts of generosity on a journey that brings him in contact with considerable suffering and occasional peril, and now she's tagging along with him ostensibly to keep him out of trouble. Lake's peak was all-too-brief but here she is at her glorious peak and she is, to dust off a film theory term, a real pill. And yes, of course they'll wind up together; ain't you never seen a Hollywood picture before? While the film's superficial paean to populism falls flat (at least for me), its tribute to the suffering and the resiliency of disenfranchised workers in a land short on jobs and overstuffed with exploiters rings true. Perhaps the most memorable shot in the movie is a pan across the faces of worshipers at a black church as a group of mostly-white prisoners (Sullivan among them – it's a long story I won't spoil for you) files in to the back so everyone can watch a Disney cartoon. The group's laugh is the sound of solidarity which, at the very least, has the advantage of being eminently affordable, and a little more plentiful when facilitated by the right movie. The ending is a bit too pat and unconvincing (according to critic David Cairns on an extra on this disc, Sturges was unsatisfied with it) but “Sullivan's Travels” is a film so quintessentially of its time that it remains timeless. When the bell finally rings, Sturges has won by a knockout. Criterion originally released “Sullivan's Travels” on SD in 2001 and I don't have it as a point of comparison. This Blu-ray re-release maintains the old Spine Number 118 but comes with spiffy new cover art. The film is presented in its original 1.37:1 aspect ratio. There are occasional signs of some minor dirt and debris from the print source but we're talking specks rather than chunks, nothing significant but not entirely pristine. I think that's perfectly acceptable for a 70+ year-old film. Black-and-white contrast is rich with a thick grain structure throughout and only the occasional bit of softness suggesting some clean-up boosting. This high-def transfer looks very good overall. The linear PCM mono track is crisp and efficient as we've come to expect from Criterion's single-channel presentations. No damage or distortion is audible. The score by Leo Shuken and Charles Bradshaw is treated pretty well by this lossless audio. Optional English subtitles support the English audio. Criterion has imported the extras from the 2001 SD release and added one more. The new one is a great visual essay (2014, 17 min.) written and directed by critic David Cairns and titled “Ants In Your Plants of 1941,” a playful suggestion that it's a kissing cousin to the next film the rehabilitated Sullivan is going to make. This essay features narration by director Bill Forsyth (of “Local Hero” fame) who is a big fan of the film. Forsyth and Cairns (in voice-over) trade off observations about the film; one new tidbit I picked up was that Sturges loosely based Sullivan's travels on real excursions by directors John Huston and William Wyler. Cairns admires the film while also noting that, like every other movie, it's not perfect. The other features are repeats from the 2001 release, including the commentary by filmmakers Noah Baumbach, Kenneth Bowser and Christopher Guest and Michael McKean. They like the movie a little bit. “Preston Sturges: The Rise and Fall of An American Dreamer” (75 min.) is an Emmy-award winning documentary directed by Kenneth Bowser and written by Todd McCarthy which aired in 1990 on PBS's “American Masters” series. It takes a pretty conventional approach to the writer-director's career but provides quite a bit of information in an entertaining, accessible manner. The disc also includes a 2001 interview (13 min.) with Sandy Sturges, wife of the writer-director. And we also get three Archival Audio clips: Sturges talking to Hedda Hopper (4 min., from a Jan 28, 1951 broadcast of “Hedda Hopper on Hollywood”), Sturges reciting the poem “If I Were A King” (1 min.) 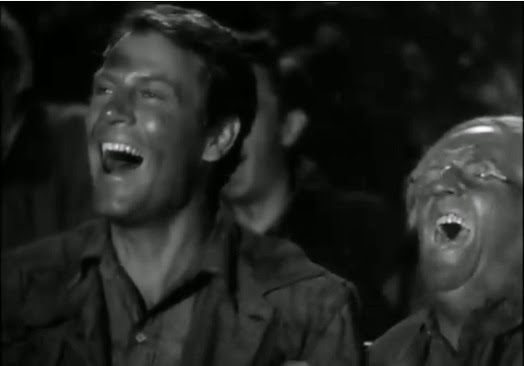 and Sturges singing “My Love” (1938, 1 min, 37 sec. ), one of many songs he composed. The slim fold-out booklet features an essay by critic Stuart Klawans. I used to hold the extreme populist premise of “Sullivan's Travels” against it, but I have since come to embrace its many obvious strengths instead. This high-def upgrade from Criterion only adds one new extra but it's a good one and the sharp new transfer is a strong one. Recommended, of course.